In the October 1977 issue of Car and Driver magazine, Technical Editor Don Sherman wrote a sidebar entitled “Electronic Wizardry: Better Living Through Microprocessors.” He predicted that “one day, electronics will manage all automobile control functions.” Forty-one years later, Sherman’s prediction is now a fact of life. Electronics and onboard computers not only manage most automotive control functions, it also manages the performance functions of most superbikes. What he didn’t predict was how electronics can help improve our driving or riding skills. Take the case of the 2018 Ducati Panigale V4. Its 90° V4 engine is packed with a myriad of electronic sensors and microprocessors to maximize performance and wring out 214 horses at a dizzying 13,000 rpm. It can accelerate from 0 to 100 km/h before you can even finish reading this sentence. But unlike wild horses, the Panigale V4’s electronics allow you to do it safely and confidently with riding aids such as traction and drift control, wheelie control, and a new racing ABS system for high speed cornering. Heck, even the optional Öhlins suspension is electronically adjustable. But let’s not get ahead of ourselves. 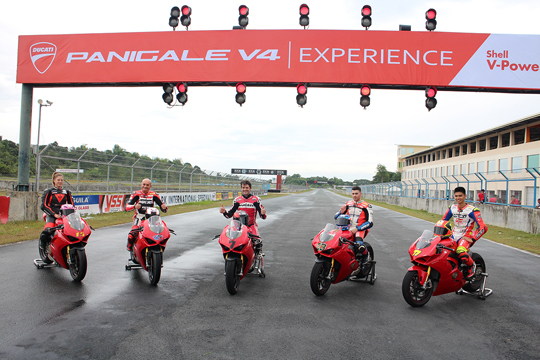 We were invited by the good people of Ducati Philippines to test ride the new Panigale V4 at the Clark International Speedway in Pampanga last November 21, 2018. The exciting activities of the aptly-titled “Panigale V4 Experience” included a chance to ride around the circuit with motorcycle racing superstars like former MotoGP rider and World Superbike (WSBK) 2011 Champion Carlos Checa; WSBK Superstock 600 rider and Women’s European Supersport Champion Rebecca Bianchi; European Superstock 1000 Championship contender Federico Sandi; and Ducati Riding Experience Technical Director Dario Marchetti. We were also privileged to ride around CIS with TJ Alberto, the only Filipino rider to successfully race in the European Superstock 1000 series in Italy. The young Alberto will undoubtedly become instrumental in assisting his proud parents, Toti and Joy Alberto, proprietors of Access Plus-Ducati Philippines, bring the desirability of the new Panigale V4 among local riders to brave new heights. After being awarded as the “Best Ducati Importer/Distributor in Asia”, Access Plus-Ducati Philippines needs to up the ante. Ducati’s superbike is put through its paces by no less than the writer, a seasoned motoring journalist. Named after the small manufacturing town of Borgo Panigale in Bologna, Italy, the 2018 Ducati Panigale V4 is the successor to the Superquadro V-Twin-equipped 1299. Its Desmosedici Stradale V4 engine was derived directly from the Desmosedici MotoGP racing engine while most of its electronic riding aids were derived from the 1299 Superleggera. The Panigale V4 was created by Ducati to combine the features of its MotoGP racing machines but in a more entertaining and easily rideable package, and with a 24,000-kilometer service interval now common on production superbikes. Ducati initially wanted to use the MotoGP race bike’s chassis for the Panigale V4 but instead went with a completely new front frame that weighed less and provided more stability. Unlike the previous 1199 and 1299 models where the engine is a stressed member of the frame, the V4 engine is now surrounded by an aluminum perimeter frame. Despite its V4 engine, the Panigale V4 is only slightly wider than the 1299 and weighs only 4.5 kilograms heavier. As expected of a Ducati superbike, the liquid-cooled 1103cc 90° V4 engine features desmodromic valve actuation. However, unlike previous Ducati models, the Panigale V4’s engine rotates in the opposite direction of the wheels, which counteracts the gyroscopic effect and decreases the force necessary to change the bike’s inclination. To help harness these traits, Ducati rotated the V4 engine further backwards and mounted the swingarm pivot near the rear cylinders instead of near the crankshaft. For better handling, Ducati equipped the Panigale V4 with that a 43mm Showa inverted front fork and mounted a Sachs rear shock absorber to its aluminum single-sided swing arm. To shorten braking distances and improve control, Ducati collaborated with Brembo to have the 330mm front disc rotors gripped by new Stylema M50 monoblock brake calipers that are 70 grams lighter than those on the 1299. They also worked with Pirelli to develop the new Diablo Supercorsa SP with its rubber compounds to improve traction and tire mileage. When the CIS’ PA system blurted out, “The track is now open for the Panigale V4 Experience media ride”, I felt a little uneasy. After all, it has been some time since I’ve swung a leg over a superbike, let alone a beautiful red Ducati with a price tag approaching a two million pesos. Luckily, Ducati Philippines’ John Neri and Marc De Joya allowed me to have a couple of 15-minute sessions around the track before the main event. I first rode a Hypermotard 939 and then moved on to a Monster 821 when other riders wouldn’t go out because of the drizzling rain and wet track. The two 15-minute seat time on the wet track were enough for me get reacquainted with the straights, twists and turns of the 4.6-kilometer Speedway. So, when time came to mount the brand new luscious red Panigale V4 S superbikes, I had quieted my nerves and gained more confidence straddling the expensive Ducati between my legs. Curiously, I mounted demo bike number 4. I got so confident that I had my bike’s Engine Power settings adjusted to “Medium” instead of “Low”, which the organizers recommended in anticipation of the wet track condition. Luckily, the rain stopped and the track dried a bit as TJ Alberto led our convoy of media riders out of the pit lane and into the track on board our respective Panigale V4 S rides. You can feel the excitement in the air as some riders were “blipping” the throttle to hear the wonderful staccato of the 4-cylinder Desmosedici Stradale. Sandwiched between me and TJ Alberto were the V4s of Aris Ilagan of Top Gear Philippines and Bing Basit of The Big Ride. TJ signaled all the riders to follow his line as we crested the first corner into a left-hand bend followed by a left hairpin and a sharp right corner. As we exited the corner, I used the majority of my V4 S’ 124 Newton-meters of torque to zoom pass Aris and Bing, and then immediately tucked into the back of TJ as we sped through a short straight. TJ was a patient leader. He would look behind to see if the convoy was keeping up with his pace and he would slow down if we weren’t. By the second lap, the other superstars were also on the track and were guiding the rest of media riders, so TJ could speed up the pace of our smaller convoy. I stayed closely behind TJ and tried to shadow his riding style, although I knew he wasn’t really giving it his all since this was just a sort of “fun lap” for the media to enjoy and get to know the Panigale V4 S.
Truth be told, I had a slight advantage over my media colleagues. I was able to ride the Panigale 1199 during the 2013 Ducati Riding Experience at the Sepang International Circuit in Sepang, Malaysia and the Panigale 1299 during a track day introduction at Clark a couple of years back. As with the 1299, I was familiar with the Ducati Quick Shifter (DQS) and used it with mucho gusto as I sped around the track with the Panigale V4 S. I used to be scared of the power delivery of the 1199 and the 1299, but the V4 was more forgiving that my trepidation in fully twisting the throttle disappeared after a few laps. It allowed me to feel that I was in full control of the machine. The riding position is similar to the 1299 where there’s a narrow space between the seat and the tank so I can tuck my legs more closely to the bike. Ducati says that the pegs are 10mm higher compared to the 1299, which makes the ergonomics of the new bike feel slightly more conventional. Power delivery feels more linear than the 1299 with a satisfying bass at low rpm and a wail that sounds almost like a twin. A couple of laps later, TJ upped the pace again. This time, we were cranking it up at the front straights, reaching speeds in excess of 200 km/h. As we reached the first corner into the left bend, I knew that I was coming in a bit too fast and a bit above my skill level. But the electronic riding aids of the Panigale V4 kicked in and I felt it assisting me to go around the corner smoother and safer. As I got more confident and more familiar with the V4, it just provided me with a civilized yet savage concoction of acceleration, deceleration, and direction changes so I could keep up with the very talented TJ around the Speedway. Theoretically, the V4’s backward-rotating crankshaft negates some of the inertia of the rotating wheels, which makes the bike easier to turn. As far as my amateur skills can tell, it worked beautifully – the bike turns quickly with less effort and holds a line flawlessly. The Brembo brakes are equally beautiful without any sign of brake fade, even when I had to mash the lever several times trying not to get too close to TJ’s bike when he slowed down to wait for the other riders. After a couple more laps, TJ guided us back to the paddocks. Our track time with the Panigale V4 S ended as quickly as it started.